Contains Ordnance Survey data © Crown copyright 2019. All rights reserved. The Halstan Printing Group offers a full range of multi-colour litho and digital printing to Government Departments, Music Publishers, Design and Marketing agencies, and Blue Chip clients in the private sector. These services include production of Annual Reports, Music Publications, Brochures, Books & Journals, Point of Sale display material, Leaflets, General Literature, Posters, Stationery and Packaging. The Company offers a full-service facility from design and graphic reproduction, through to all forms of finishing, followed by national and international distribution. Our location gives us great transport links. We are 10 minutes from motorway networks and central London is only 40 minutes away by public transport. Halstan recognises its responsibility to the environment, and is committed to the continuous reduction of the environmental impact of our business. Our factory is built to unusually-high environmental standards. We recycle heat and use compressed air, not only to run the printing presses and binding lines, but also to heat the factory itself. Our standard stock papers are the most environmentally-responsible grades, and we also recycle all our aluminium, solvents, and waste chemicals. At Halstan we understand we will be judged by our service, not what we say. We print the exact number of copies you know you can sell. Halstan will store the book in a ready-to-print format. Eliminates the need for warehousing. Never goes out of print. No wastage or pulping books you can’t sell. 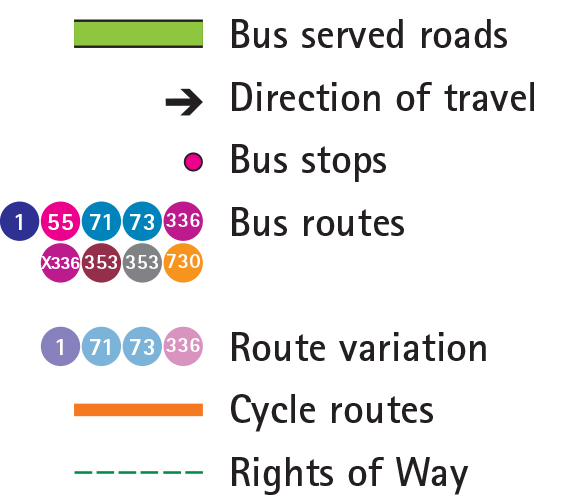 All bus routes to/from Amersham call at Amersham Rail and Tube Stations, while some also call at Woodside Road or Old Amersham, Broadway. Monday to Saturday daytime every 15† minutes, evenings 30-60 minutes. Sunday daytime every 60 minutes. * Early morning journeys operate via Station Road. † Chesham Broadway to High School every 30 minutes. Monday to Friday daytime 5/6 return journeys, evening 1 return journey. Monday to Friday daytime approx. 30-60 minutes, Saturday daytime 4/5 return journeys (71). * On Saturday service 73 serves Coleshill instead of Penn Street. † Monday to Friday (73); 1 afternoon journey from Whelpley Hill and Saturday (71). Monday to Saturday daytime approximately every 60 minutes. Monday to Friday daytime 5 return journeys. Saturday daytime 1 return journey. 1 early morning Monday to Friday journey serves Old Amersham (not shown on map). Sunday daytime 4 return journeys. Monday to Saturday daytime and early evening every 60 minutes. Early morning and early evening journey start/finish at Chesham. A frequent service operates between London Marylebone and Aylesbury, stopping at several locations along the way including Harrow-on-the Hill and Great Missenden. Approximate journey time from Marylebone is 35 minutes. Metropolitan Line – Amersham to Aldgate via Baker Street. Two trains per hour to/from Amersham. All trains serve Harrow-on-the-Hill, however some trains do not serve all stations between Moor Park and Finchley Road. Approximate journey time from Baker Street is 50 minutes. Cycles are allowed on Chiltern Railways trains with certain exceptions at peak times and on parts of journeys. Please check operator information for details. Secure cycle parking is available on the Halstan site. Cycling is a great way to stay fit and healthy as well as saving money – no petrol costs or queuing traffic! Amersham Rail Station – 0.7 miles (1.2 km), 14 minutes. Woodside Road – 0.4 miles (0.7 km), 8 minutes. Chesham Road – 0.6 miles (1 km), 13 minutes. Walking is great exercise – good for the heart, reducing the risk of many diseases and an excellent way of losing or maintaining weight. Finding your way to Halstan’s factory by car is relatively simple. If you have a SatNav enter the postcode HP6 6HJ. Alternatively if you are following a map please see below for suggested route options, then as you approach Amersham refer to the map overleaf. Halstan actively promotes sustainable modes of travel. If the only viable option is travel by car we encourage car sharing to make journeys more environmentally-friendly. Parking spaces will be made available for customer visits. Contains Ordnance Survey data © Crown copyright 2019. All rights reserved. Site and cartography by Pindar Creative. Tel: 01296 390100.